Kawara Shashinki-ten (河原写真機店) was a Japanese distributor based in Osaka, active from the early 1920s to the early 1940s. 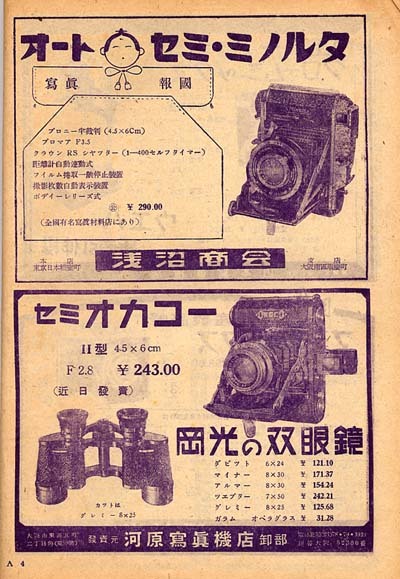 It advertised the Okaco, the Oko Six and the Letix at the beggining of the 1940s. ↑ The address in 1921 was Ōsaka-shi Higashi-ku Hironomachi 4 (東区平野町四丁目). Source: advertisement in Ars Camera September 1921. The address in 1941 was Ōsaka-shi Higashi-ku Kawaramachi Denteimae (大阪市東区瓦町電停前). Source: advertisement reproduced in Kokusan kamera no rekishi, p.61. Ars Camera. Advertisement by Kawara Shashinki-ten in September 1921. No page number. This page was last edited on 28 March 2008, at 15:33.